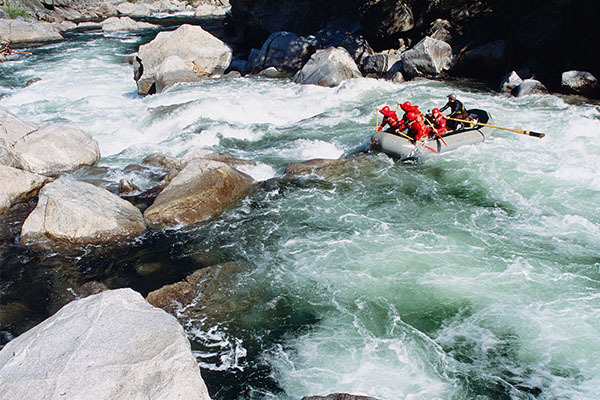 Cherry Creek is the most challenging commercial river rafting trip in California, and perhaps the entire United States. With a phenomenal twelve Class V rapids and many unnamed Class IV drops, this 9-mile run is incomparable. 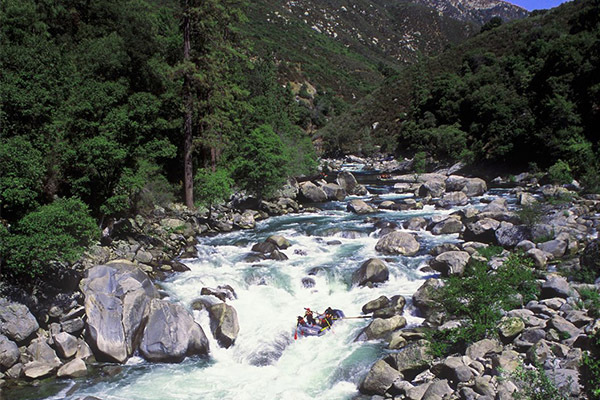 An evening of Class V instruction followed by a full day of the most challenging whitewater in California. Class IV warm-up first mile–Class V next 8 miles! This trip meets the night before for Class V instruction and to review several important details of the following day. The next morning starts very early. 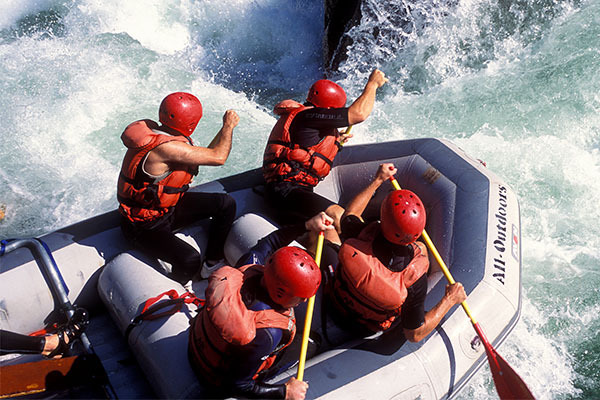 After a quick breakfast at put-in, you'll jump into your boat and take on several Class IV rapids right out of the gate. Then we'll stop to test our swimming skills in a Class II rapid before we venture into the Class V section of the river. Class V Corkscrew and Jawbone rapids are our first challenge, then we tackle the staircase drops and boulders of Class V+ Mushroom Rapid. Just when you think you've seen the ultimate in Class V rafting, along comes Miracle Mile--a mile-long succession of Class V rapids. After Class V+ Lewis' Leap, you'll help portage the boats around two waterfalls. Three Class IV rapids will speed us to our take-out, where you'll enjoy a well-earned late lunch. Some say Cherry Creek isn’t the most difficult run in California. They say it’s the most difficult in the entire United States! The river’s 15 Class V whitewater rapids are generated by the canyon’s steep gradient—the river drops more than 100 vertical feet per mile. Narrow and steep, the river is often choked with huge boulders. When you reach the bottom of a Cherry Creek rapid you’ll look back upstream exhilarated, and wish you could hike back up and do it again. You’ll come for the whitewater, but you’ll fall in love in with the canyon’s beautifully-rugged hills, timeless oaks, and crystalline water rushing past sculptured granite boulders. Because only two outfitters run Cherry Creek, few get to paddle this stunning stretch of the Tuolumne; your group will likely be the only one on the water. This exclusivity means Cherry Creek trips offer nearly private access to a remarkable and isolated canyon. Just two and half-hours from Sacramento and only three hours from San Francisco, Cherry Creek is close to many metropolitan areas. Highways 140, 120, and 49 are in close proximity. 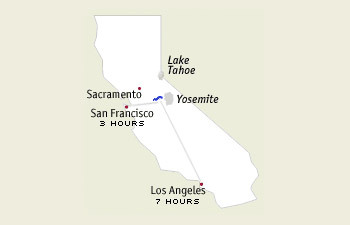 Explore other Yosemite whitewater rafting trip options. Cherry Creek is a dam-controlled stretch of the Tuolumne River and becomes raftable at lower flows, after the springtime snow melt. Trips therefore usually begin in mid-summer. * Season length, river flows, and days of water releases may vary. For this year's flow predictions and real-time water levels go to the River Flows page. 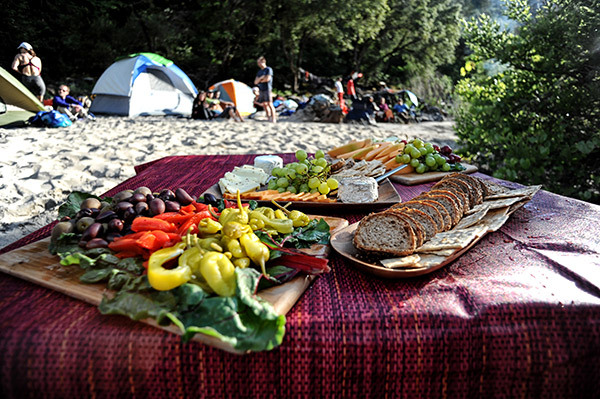 Every All-Outdoors trip includes delicious riverside meals. On Cherry Creek, our gourmet "build-your-own" sandwich bar includes all the fixings needed to assemble the perfect sandwich to your preference. There is a beverage, and cookies to finish it off. We provide breakfast the day of your trip, as well as snacks the night before and during the trip. If you have special dietary requirements, we encourage you to tell us when you reserve your trip. We will do our very best to accommodate your needs. All-Outdoors runs oar-paddle combination rafts on Cherry Creek. In an oar-paddle boat, a professional guide steers the boat with oars while simultaneously calling commands to paddlers. It is imperative that everyone be willing and able to paddle. Each guest on our Cherry Creek trips should weigh under 250 lbs, be physically active, have prior watersport experience, be able to swim, and be willing to follow guide instructions in a team environment. First, we offer an intensive Cherry Creek orientation the night before your trip begins. The purpose of the orientation is to familiarize guests with the special requirements of advanced class V rafting, as well as to create group cohesion. Rafting Cherry Creek requires team work and trust; we start building a foundation early so you have the best trip possible. Second, every All-Outdoors Cherry Creek trip is lead by a Guide Boat or Cataraft. 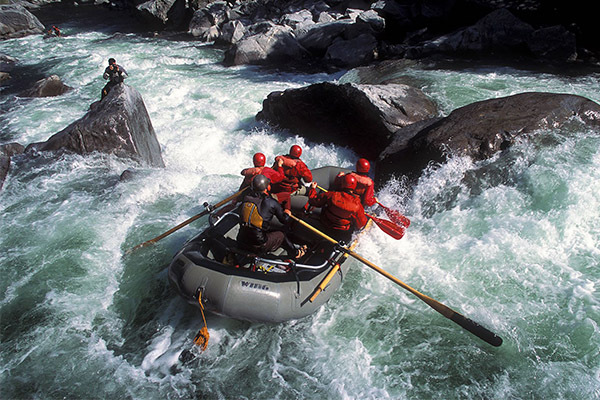 The Guide Boat is paddled by AO guides and runs at the front of each trip to create a “safety net” below rapids. The extra guides also help foster smooth execution of on water trip logistics. Still have questions about Cherry Creek and whether it is appropriate for you and your group? Visit the Cherry Creek FAQ. "All Outdoors does a great job. Good equipment, good Safety, great guides, good food. I was very impressed that our two boats with four clients each had a guide boat in front with three guides and one in back with another guide. Safety on the river was paramount. I look forward to another run on Cherry Creek."